蓮池祩宏 Lianchi Zhuhong. 淨宗八祖 The 8th patriarch of the Pure Land School. "Of the 13 patriarchs of the Pure Land School, there are seven who are accomplished Chan Masters. They are: Cheng Yuan 承遠, Yong Ming 永明, Lian Chi 蓮池, Ou Yi 藕益, Xing Ce 行策, Sheng An 省庵 and Che Wu 徹悟." 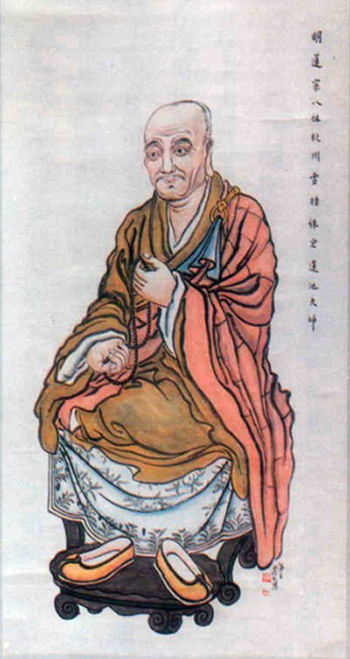 Zhu Hong (Chinese: 祩宏; pinyin: Zhù Hóng; Wade–Giles: Chu Hung; 1535–1615) Chinese Buddhist leader and anti-Jesuit. He was known as the “Master of Yunqi”, after a monastery restored in his honor. He was born in Hangzhou into a family with the surname Shen. Zhu was an excellent student, although he never succeeded along the path of officialdom. 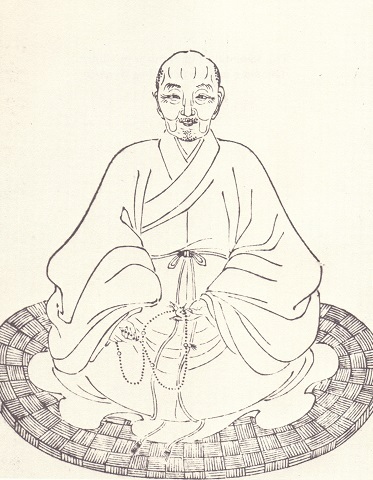 His first connection to Buddhism was that of the Pure Land variety. After failure in the official examinations he became a monk at thirty-one despite the existence of his second wife, who later became a nun. Zhu Hong died at the age of eighty-one. Zhu Hong is best remembered for his persistent hostility to Roman Catholicism. Zhu's writings are a direct rebuttal to the Jesuit Matteo Ricci (利瑪竇).Traditional Buddhist monasticism had declined by Zhu Hong's age. The English translation of heshang (和尚) as “monk” by the late Ming is perhaps inappropriate. A better rendition might be “priest” as it is often used in Japan to describe those specialist practitioners of funeral rites and memorial services. Zhu Hong himself complained that “Monks are also geomancers, diviners, physiognomists, physicians, gynecologists, potion makers, spirit healers and alchemists. All of the above entail the extreme demise of Buddhism (Sanbi, p. 12b).” The Jesuit entry into sixteenth century China placed them in the middle of such conditions. For Zhu Hong and other Buddhists the Jesuits were an additional headache to a long list of serious problems. Zhu Hong's rebuttal of Catholicism was the first of a longer and ever-growing response.At the first stage of anti-Catholicism the Buddhists had a weak grasp of the religion. Zhu's Tianshuo (天说, Explanation of Heaven) appeared in his Sanbi collection in 1615. Matteo Ricci's monumental theological work Tienzhu shiyi (天主實義)　had already appeared in 1596. Zhu Hongs polemic coincided with the political appointment of Shen Que (沈隺, d. 1624) as vice minister of rites in Nanking (Nanjing) and his initiation of an anti-Catholic campaign from official circles in 1616. Zhu Hongs collected essays, the Zhuzhuang suibi was written and published in three sections, the Chubi (初笔), Erbi (二笔) and the Sanbi (三笔), modeled after the classic Song period collection Rongzhai suibi. Zhu Hong's first collection was published in 1600 at age 70, the second and third at age 81 in 1615. "Jeffrey L. Broughton offers an annotated translation of the Whip for Spurring Students Onward Through the Chan Barrier Checkpoints, which he abbreviates to Chan Whip. This anthology is a classic of Chan (Zen) Buddhism that has served as a Chan handbook in both China and Japan since its publication in 1600. It is a compendium of extracts, over eighty percent of which are drawn from an enormous Chan corpus dating from the late 800s to about 1600-a survey that covers most of the history of Chan literature. The rest of the text consists of complementary extracts from Buddhist sutras and treatises. The extracts, many of which are accompanied by Chan master Dahui Zhuhong's commentary, deliberately eschew abstract discussions of theory in favor of sermons, exhortations, sayings, autobiographical narratives, letters, and anecdotal sketches dealing frankly and compassionately with the concrete experiences of lived practice. While there are a number of publications in English on Zen practice, none contain the vivid descriptions found within the Chan Whip. This translation thus fills a large gap in the English -language literature on Chan, and by including the original Chinese text as well Broughton has produced an invaluable tool for scholars and practitioners alike." -- Abbreviations -- Introduction -- Whip for Spurring Students Onward Through the Chan Barrier Checkpoints -- Preface to Whip for Spurring Students Onward Through the Chan Barrier Checkpoints -- Front Collection: The First Gate -- Front Collection: The Second Gate -- Back Collection: Single Gate -- Chinese Text of Changuan cejin -- Bibliography. Berkeley, Calif.: Asian Humanities Press, 1992. Frontiers in History of China 8/3 (2013): 389-405. New York : Sutra Translation Committee of the United States and Canada, 1994. This volume consists of excerpts from two Chinese Buddhist commentaries: The Collected Works of Master Yun-ch 'i Chu-hung (Jpn. Unsei Shuko) and Direct Pointing Back to the Source by Master I-yuan Tsung-pen. These texts, well-known in East Asia, appear here in English translation for the first time. Master Chu-hung (1535-1615), also known as Yun-ch'i or Lien-ch'ih, was (along with Han-shan Te-ch'ing and Tzu-po Chen-k'o) one of the three "dragon-elephants" or most illustrious monks of the Ming period. Together, they were responsible for the revival of Buddhism in sixteenth century China, a revival which still influences Buddhism today. Trained as a monk in both the Zen and Pure Land traditions, Master Chu-hung emphasized strict observance of monastic discipline, active participation of laymen in Buddhist life and the dual practice of Zen and Pure Land. 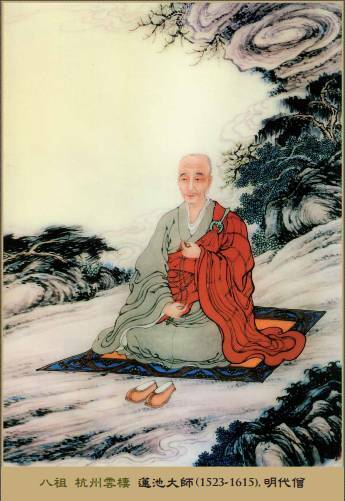 Master Tsung-pen, also known as I-yuan, was a sixteenth century Chinese Zen Master who lectured widely on the Buddhist Canon. Recognition was, in time, granted by the Emperor, who conferred upon him the title Master of Merit and Virtue. Elder Master Tsung-pen wrote the commentary excerpted in this volume while serving as abbot of the temple appropriately known as Pure-Land Zen Monastery. Attributed to Matteo Ricci, the Bianxue yidu 辯學遺牘 (ca. 1623) is an apologetic work that explains and defends Christian doctrine against the criticisms and misunderstandings of the Buddhists whom Ricci encountered and debated, specifically the lay Buddhist Yu Chunxi 虞淳熙 (jinshi 1583, died 1621) and the monk Zhuhong 祩宏 (1535-1615). Cf. Standaert, Handbook of Christianity in China , p. 617. The second part of the book is a refutation by Ricci of the statements the Buddhist monk Zhuhong 祩宏 made in his four Tianshuo (On Heaven) essays 天說四端. 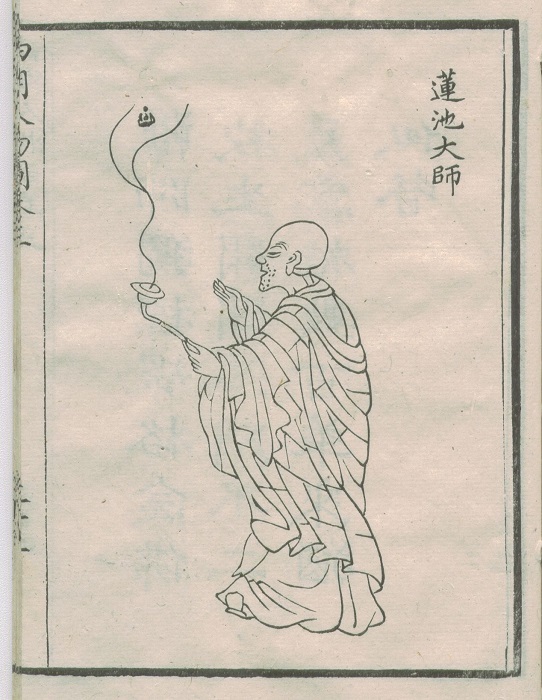 The monk Lianchi 蓮池和尚 (1535–1615) was a native of Renhe 仁和 (Hangzhou, Zhejiang). His family name was Shen 沈. He was a Confucian scholar before he became a monk. His religious name was Fohui 佛慧, but he was better known as Zhuhong 祩宏. For thirty-two years he was abbot of the monastery of Yunqi 雲棲 and he was considered one of the most distinguished Buddhist monks of the late Ming dynasty. 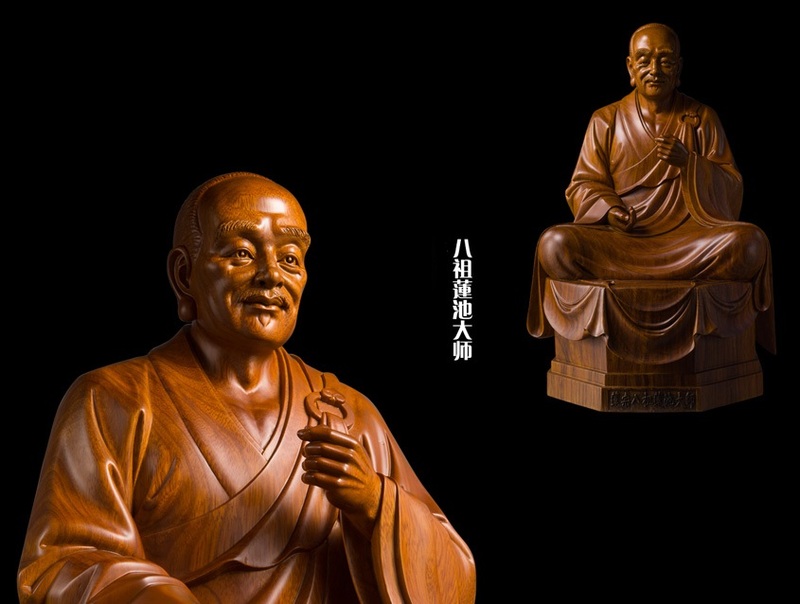 He and Yu Chunxi were looked upon as leaders of Buddhism in southeast China. Among his writings are the Yunqi fahui 雲棲法彙 and the Zhuchuang suibi 竹窗隨筆 and its sequels Erbi 二筆 and Sanbi 三筆. The last-mentioned book contains the four Tianshuo essays, in which he criticizes Ricci, saying: Though he worships the Lord of Heaven, in reality he has no conception of Heaven. . . . According to him the Lord of Heaven is a being without form, without color or sound. One can then only conclude that Heaven is nothing more than [pure] reason. But how can [pure reason] rule its subjects, or promulgate laws, or reward and punish? He [Ricci] may be an intelligent person, but he has never learned the scriptures of Buddhists; what could be expected but that his doctrine would be wrong. The main point of Ricci's refutation of the criticism of Zhuhong lies in the argument that the Buddhists regard Buddha as the supreme lord. Therefore he is above the Lord of Heaven, which is simply absurd. This is an unforgivable error. For this reason he wrote: Hence I am most willing to carry out a debate . . . , otherwise what is evident will remain obscure. . . . But there should be order in a debate, the debaters must be governed by reason. No one should bring up wrong traditions in his arguments; that would be to believe in hearsay rather than to follow reason, and that seems childish and would be to no point. It is clear that Ricci was aiming at the unfounded doctrine of Zhuhong about Heaven. In the remaining chapters Ricci tried to refute the errors of Buddhism on reincarnation, on sacrifice and on the prohibition of killing animals. His arguments are based on reason and combined with great eloquence. 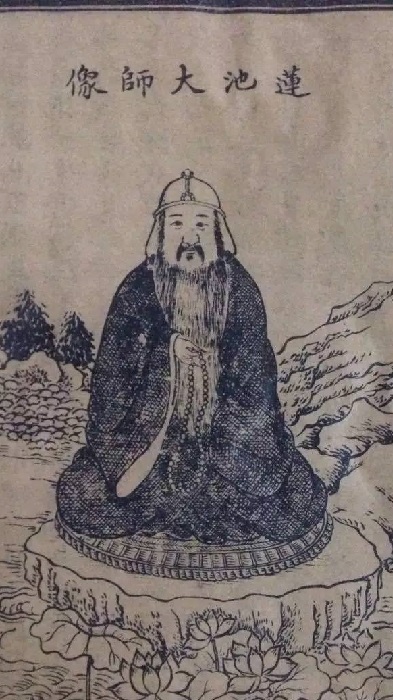 There is a postscript at the end of the book by Liang'an jushi 涼庵居士: Lianchi (Zhuhong) changed from a Confucianist to a Buddhist, and Deyuan (Yu Chunxi) was a profound scholar on the writings of Buddhism. Both were leaders of Buddhist followers in southeast China. Their belief was very different from the teachings of Mr. Li (Ricci). Reading now these letters in which they carried out their discussions, it gives the impression that they respected one another highly. Each tries to expound his learning with sincerity in the hope that the truth may appear. Unfortunately they never came to a conclusion. How regrettable that within a short period they all passed away. Had they had the opportunity to come together to discuss their knowledge freely and to propose their difficulties as open-minded philosophers, they would certainly have exhausted the subject without reservation of their talent. This might have brought to light hidden points and subtle ideas which undoubtedly would be of great enlightment to the ignorant. How lamentable that this never came to pass. I received this manuscript accidentally from a friend of mine, and once more my old sentiments revived. I therefore decided to have the manuscript published in the hope that the memories of these venerable persons will not diminish throughout the years. However, I must confess that I am not the person to decide upon the quality and the orthodoxy of their learning. (Signed by Liang'an jushi) This Liang'an jushi is Li Zhizao 李之藻 himself, the man so tenderly referred to in the writings of the early missioners as “Doctor Leo.” The postscript mentions that the three authors of this book had all passed away. Now, Ricci died in 1610 (Wanli 38), Zhuhong in 1615 (Wanli 43) and Yu Chunxi in 1621 (Tianqi 1). Hence the title of this book speaks of yidu (memorial letters). This book is included in the Tianxue chuhan 天學初函, which was published by Li Zhizao in 1629 (Chongzhen 2). [or 1626, Cf. Handbook] There is a reprint made from wooden blocks by the Lazarists in Beijing (Catal. 1924, no. 88). The text was also reprinted in moveable-type characters in 1915 by the Ta-kung Pao [Dagong Bao 大公報] periodical (Tianjin). Four years later, in 1919, Ying Lianzhi 英斂之 had it published in Beijing with prefaces by Chen Yuan 陳垣 and Ma Liang 馬良 (Ma Xiangbo 馬相伯). According to the preface of Chen Yuan, the letters in this book were not written by Ricci himself, but by his followers after his death. Li Zhizao's postscript, however, makes us think that Ricci was the author. Perhaps the drafts were done by one of Ricci's friends; or the ideas may have come from Ricci and been put into writing by a Chinese scholar. Cf. Pfister, p. 36; Hsü 1949, pp. 119–120; SKTY 3:2628; FR 2:306 n. 1; DMB 1:322–324 (Chu-hung).